NASA's shuttle Endeavour is headed for the International Space Station to deliver a major space experiment and other supplies. But before Endeavour arrives, its six-astronaut crew must scan their vital heat shield for any dings it may have picked up during the shuttle's Monday launch. "I want to thank Gabby, Claudia and Claire for that great wakeup song. It's always good to hear," Kelly added. "Here's to a beautiful day in space!" Kelly and his crew awoke at 11:56 p.m. EDT Monday night (0356 Tuesday GMT) and have a busy day of spacecraft inspections ahead. The astronauts will use the space shuttle robotic arm to closely examine the heat shield panels along the shuttle's wing edges and nose cap for any signs of damage from falling debris during launch. "Those were very small losses, they didn’t look like they went anywhere near the orbiter," said Bill Gerstenmaier, associate administrator for space operations. "Those looked like they're no problem to us at all. The tank performance was probably better than I expected." 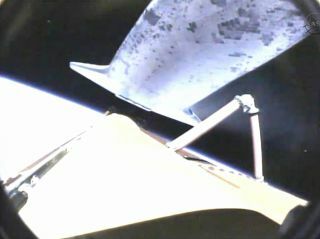 "The vehicle looked very good going uphill," said Bill Gerstenmaier, associate administrator for space operations.